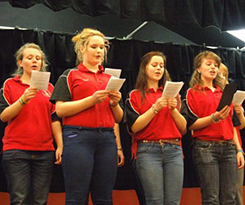 Every year the YFC present a form of entertainment on a three year rotation. They are Drama, Entertainment and Pantomime. This year will be Entertainment competition. English Entertainment Prelims will be on the TBC Feb 2019 with the final taking place on the Tbc Feb 2019 at Ysgol Bro Gwaun. Welsh Entertainment will take place on the tbc 2019 Theatr Y Gromlech, Crymych. There will be plenty of talent on show as well as fun filled evenings of entertainment. So if you can come to either or both the Welsh and English competitions to show your support. If you require any further information contact us we’ll be happy to help.